Dom Manfredi is one of four players who return to Wigan's 19-man squad for Friday's visit of Huddersfield Giants. But coach Adrian Lam has left out winger Tom Davies and halfback Jarrod Sammut from the side which lost 18-16 at London Broncos last Sunday. He didn't indicate either was injured during his weekly press conference. 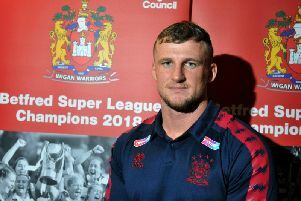 Manfredi is poised to play his first match since scoring two tries in last October's Grand Final, having missed the opening few weeks because of a clean-out operation on his knee. Ben Flower, Gabe Hamlin and Liam Marshall also return to the 19-man squad after a week's absence. Joe Greenwood again misses out due to concussion protocol, while Joe Burgess is around two weeks away from returning. Dan Sarginson had to leave the Broncos game early with a corked thigh. His chances were this week given as "50-50" - Chris Hankinson's inclusion suggests he is on stand-by. Akuila Uate, Joe Wardle and Oliver Roberts are among a number of returners in Simon Woolford's 19-man squad. Wigan's 19-man squad: Joe Bullock, Tony Clubb, Morgan Escaré, Ben Flower, Oliver Gildart, Gabe Hamlin, Chris Hankinson, Zak Hardaker, Willie Isa, Tommy Leuluai, Dom Manfredi, Liam Marshall, Romain Navarrete, Sean O’Loughlin, Liam Paisley, Sam Powell, Dan Sarginson, Taulima Tautai, George Williams. Huddersfield's 19-man squad: Darnell McIntosh, Jermaine McGillvary, Jordan Turner, Akuila Uat, Lee Gaskell, Matt Frawley, Kruise Leeming, Suaia Matagi, Aaron Murphy, Alex Mellor, Michael Lawrence, Adam O'Brien, Oliver Roberts, Ukuma Ta'ai, Jake Wardle, Sebastine Ikahihifo, Sam Hewitt, Innes Senior, Joe Wardle​.